84 million Europeans are living in homes that are too damp, resulting in respiratory illnesses such as asthma and chronic obstructive pulmonary disease, according to the latest research by the Fraunhofer Institute of Building Physics. The German Institute also found that respiratory illnesses cost European Governments £82 billion a year due to medical treatments and loss of productivity, and as a result the VELUX Group is calling for healthier homes to be central consideration for the new European framework for national building legislations, which will impact UK house builders once implemented. Damp or mouldy dwellings can increase the risk of developing a respiratory disease or life-long allergy by 40 percent, demonstrating a direct correlation between indoor environments and human health. The research by Fraunhofer IBP, based on cross sectional study, questionnaires and case studies across 32 countries, found that 2.2 million European citizens have developed asthma directly because they live in unhealthy buildings. The study also estimates that damp and unhealthy dwellings could be reduced by half by 2050, which could reduce the number of people with associated respiratory diseases by 25%. Grant Sneddo, Product Manager at VELUX GBI, has pointed out how upcoming revisions to the Energy Performance of Buildings Directives, under the Energy Union, can not only improve human health but also the economy. Read the full Fraunhofer IBP white paper here. One of the main causes of damp and mould in homes is a lack of sufficient ventilation. This can be reduced by specifying the correct building fabrics during renovations. 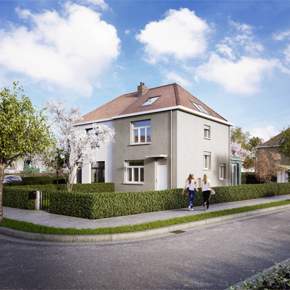 In April 2016, VELUX completed the RenovActive project in Belgium (pictured), a renovation based on Active House principles including architectural quality, human health, comfort and well-being, energy efficiency and environmental benefits. One of the key elements of the project was the prevention of indoor dampness and mould, achieved through a natural and continuous airflow in the house.